Preface (M. Harmata).The [5+2] cycloaddition chemistry of &bgr;-alkoxy-&ggr;-pyrones (J.L. Mascareñas). Metallocarbenoid-induced cyclization of acetylenic diazo carbonyl compounds (A. Padwa, C.S. Straub). Recent applications of Cr(0)-mediated higher order cycloaddition reactions to natural product synthesis (J.H. Rigby). Indole as a dienophile in inverse electron demand diels-alder and related reactions (L. Lee, J.K. Snyder). Aspects of the intramolecular diels-alder reaction of a furan diene (IMDAF) leading to the formation of 1,4-epoxydecalin systems (B.A. Keay, I.R. Hunt). An allenic [2+2+1] cycloaddition (K.M. Brummond). Index. 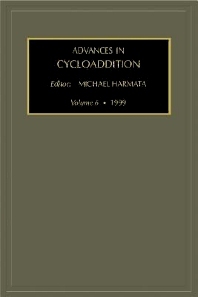 This volume presents work from six different groups working on various aspects of cycloaddition chemistry. José Mascareñas gives us a very interesting account of the chemistry of &Bgr;-alkoxy-&ggr;-pyrones and related species. Al Padwa and Chris Staub discuss further advances in rhodium carbenoid chemistry and the unusual cycloaddition processes possible with these intermediates. Higher order cycloadditions mediated by transition metals highlight Jim Rigby's update on his group's efforts in this area. Lily Lee and John Snyder present us with a detailed account of the indole ring as a dienophile, challenging us to consider the untapped potential in this area. Brian Keay and Ian Hunt discuss the intramolecular Diels-Alder reactions of furan; a report that is both top-notch science, and what could be a great learning tool for students who need to see how fundamental chemical principles can and should be applied to synthetic problems. Finally, Kay Brummond introduces us to a new version of the Pauson-Khand reactions, one that will no doubt be further exploited in productive ways by her group well into the future. For those with an interest in cycloaddition methodology and its impact on the ongoing research into synthetic organic chemistry.